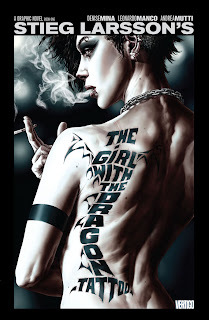 This review of volume one of Vertigo's two-volume adaptation of Stieg Larsson's The Girl with the Dragon Tattoo will be unlike most others because I have not read any of the books nor seen any of the movies. The most of my experience prior to this graphic novel was a movie trailer and a couple of back-cover summaries. As such, I was able to approach the graphic novel by Denise Mina as if it were the book itself -- to consider how it functions as a story on its own, not how well or poorly it lives up to the original or other adaptations. The first volume of Girl with the Dragon Tattoo takes a risky tack in that it ends before the two principle characters, journalist Mikael Blomkvist and hacker Lisbeth Salander, ever meet one another. Breaking books into two entities is in fashion these days -- see the final two Harry Potter movies, the final two Twilight movies, or the apparent three upcoming Hobbit movies -- but one is lead to expect a relatively complete experience from each. The first volume of Girl has a full arc, but the book's overarching mystery barely gets under way. Volume one is essentially just an introduction to the characters, and readers -- especially those readers more used to prose than graphic novels -- may be surprised by this book's lack of forward action. If these books do well, there's precedence for Vertigo/DC Comics to combine two parts of a story into one "deluxe" or "omnibus" volume, and readers might be advised to wait for that. Salander is by far the front-most character in this volume (hard to say how this matches with the book -- Salander is the titular "girl," but at the same time I imagine the movie wouldn't have cast Daniel Craig as Blomkvist to just stand around). Mina succeeds right away in convincing the audience both of Salander's intellect and awkwardness, in her introductory scene where Salander is brusque with a client. Artists Leonardo Manco and Andrea Mutti depict Salander growing increasingly annoyed as she struggles to understand an inference that she should investigate the Wennerstrom company further; when she finally understands, Salander's glare along with Mina's well placed "[you] could have just said that" make the character clear in just a scant few pages. Though this is a strong moment of clarity, the book more often errs toward too much subtlety. Blomkvist comes off as an unbelievable Lothario, with women simply falling into bed with him (two panels of Blomkvist in two parts of the book waking up with two different women are so similar as to seem an unintended parody). Cecilia, whom Blomkvist meets in his investigation of the Vanger family, is meant to be awkward in the style of Salanger, but her ovature to Blomkvist arrives with too little build-up, as if Mina trusts the reader can hear a tone in the characters voices that doesn't come through. Similarly when Blomkvist fights with Cecilia toward the end of the book, it's entirely unclear that Cecilia is angry until Blomkvist says aloud, mid-scene, "You seem kind of pissed off." Similarly, there's an entire subplot in which Salander ventures out to hack something, but her location and what she photographs and what she does with her computer aren't clear in these mostly-silent scenes. Possibly this is something Mina and Larsson reveal in the second half of the book, but for the moment they're pages that audience looks at, acknowledges, but can't feel much emotion for because we're given little context for them. Manco and Mutti don't always differentiate the characters well, either (Blomkvist and Martin Vanger look too similar, for instance), necessitating second and third reads of some pages, and the final splash page in which Salader imagines various of the characters surrounded by fire falls flat as the reader tries to discern exactly who she's thinking of. Though this may be a too-easy accusation to make in reviewing an adaptation, in each of these examples it seems the creative team has too great an expectation that the audience has read Larsson's novels or seen the movies beforehand, such to intuit details the creative team doesn't make clear themselves. Especially given that Girl Volume 1 feels abbreviated, pages without significant resonance come off as wasted space. This is true of the hacking scene and before it, when Mina gives too much space to Salander sneaking into a building. Early in the book, Mina uses an entire panel of a three-panel page simply for an acquaintance to call to Blomkvist from across a dock; on the next four-panel page, Mina uses one panel for the two to say hello to each another, and another just for the acquaintance to remark on running in to Blomkvist. The pacing does not remain a problem throughout, but intermittently, as in scenes within the Millenium magazine offices, conversations unfold with one character speaking one line of dialogue per panel, suggesting again room where more content could have been added. Still, Girl reads swiftly both in its emptier and fuller moments, borne largely by the strength of the book's mystery. Manco and Mutti depict well the wide expanses of Hedeby Island where the Vangers live, and the disappearance of Harriet Vanger unfolds vividly in flashback. Here, Girl evokes Agatha Christie's And Then There Were None with the Vanger family potentially trapped on the island with Hariett's killer. The panic they're meant to have felt is palpable, especially when Blomkvist interviews the policeman Morell. Mina and Larsson succeeded in drawing me in, even if the payoff won't come until volume two. The Vanger story reads like a sub-plot, however, to Salander's struggle first to make herself understood, and then when she's raped by and takes revenge on her state guardian Nils Bjurman. Mina and the artists use the sequential art form well here, purposefully echoing the panels of Bjurman's attack in Salander's own violence later on. (The cover of this volume by Lee Bermejo, on the other hand, seems both inappropriate and out of touch with the characters given the contents of this book). My only concern is that by making this the focus of volume one, with both a crisis and resolution, the book would seem to suggest that Salander's trouble is over -- that in brutalizing Bjurman, Salander has put his assault behind her. But these moments are too savage to be relevant in just this one volume -- to be "introductory," as much of this book is. Hopefully Mina recognizes this also, and there's sufficient emotional "flow" through the rest of the volumes, despite their rather forced episodic nature. Ultimately, The Girl with the Dragon Tattoo, Vol. 1 emerges as mostly just an appetizer -- not just for the prose book, as might be proper, but for itself, for its second volume and the other books in the series. Maybe this first, less-polished volume will lead to stronger editions later on; it's an interesting read but far too slight, and would not itself be enough to launch a series without the weight of the books and movies behind it. I thought this was such a great idea when I first heard about it. But, and maybe this is just showing that I've been disconnected from reader habits for the past year or so, but are people still crazy enough about these books that this is still considered a big coup for graphic novels? I wonder this too, Tony. I've read the prose novel and seen the American film, but I can't fathom what hole in the marketplace is being filled by this book. I remember a big marketing hullabaloo when this was announced, but I have seen very little promotion, which is worrisome. I'm sure I will read this if I find it at the library or something, but I don't feel that I "need" this book in the way that I'm drawn to most other trades on the market. As for Blomkvist bedding an inordinate number of women, I always felt that the character was a Mary Sue for Larsson himself, and a poorly disguised one at that. As compelling as the book was, I never understood what Blomkvist's bedroom escapades had to do with the rest of the plot. At the time I thought it was a coup for Vertigo -- that they got the license to adapt these books and not anyone else; it does make Vertigo seem "mature" and "hip" in a mainstream way. But I still can't get over breaking each book in two; I saw this volume in a bookstore the other day, and I just can't believe a general reader will have the patience to wait a year for the second half of book one.